Tesda now offers online courses that aims to benefit Filipinos who aims to upgrade or learn new skills but has no financial means to do so. The free Tesda Online Courses have no tuition fee and offers a range that many can choose from, from programming, digital arts to bartending and other skill developments. The various programs available online were created for professional, out of school youths, laborers, OFWs and others who want to develop technical knowledge and skills. The online courses gives the students or workers the ability to study their chosen program at their own leisure without putting their studying or working hours on the line. All they need are reliable internet connection and a computer. While the end of the course does not offer certificates, they will be able to get one after they take assessment tests in a Tesda assessment center. Once passed the assessment test, they can now claim the certificate and use it to find a job. If you are interested to enroll in one of the courses, you must first register an account in http://e-tesda.gov.ph and provide a valid email address to finish the registration. For more information you can also visit a Tesda school near your place. 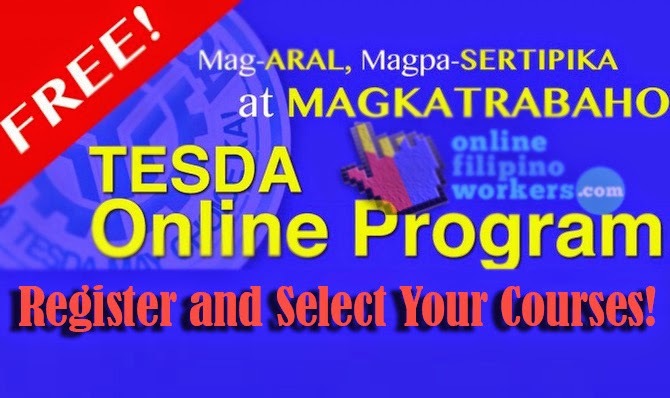 To register, you must first visit the Tesda online program website at e-tesda.gov.ph. You will find a button on the upper right corner of the page that says ‘Login’. Click the link to be directed to another page. You have to click ‘New Account’. You can now make a new account. Fill in the information being asked in the form. Make sure that all information are properly filled in and you did not left out a space. Make sure that your email address is valid and you can immediately open it. After clicking ‘Create My New Account’, a message will be sent to your email. Open you email account to verify your Tesda account. After verifying your account, you will then be redirected to the Tesda website to choose a course you would like to take. Login your account and check the list of the offered courses. Once you had chosen a course, you will be directed to a list of modules where you can click a link to start with it. On the lower left corner, click ‘Enroll Me in This Course’. A pop up window will ask for your confirmation to which you have to choose Yes. You can now start learning the course. Once you finish it and you want to get a certificate, head to a Tesda office and take an assessment test.